I know it’s a bit late for Halloween humor, but oh well. Just some late birthday goodies I bought for myself with my birthday gift cards – thanks again Mom, Dad and Sweetie-pies! I feel the creative juices flowing at the mere thought of playing with all my new colors and brushes. I typically use the Chinese brushes as my work is usually loose and contemporary. 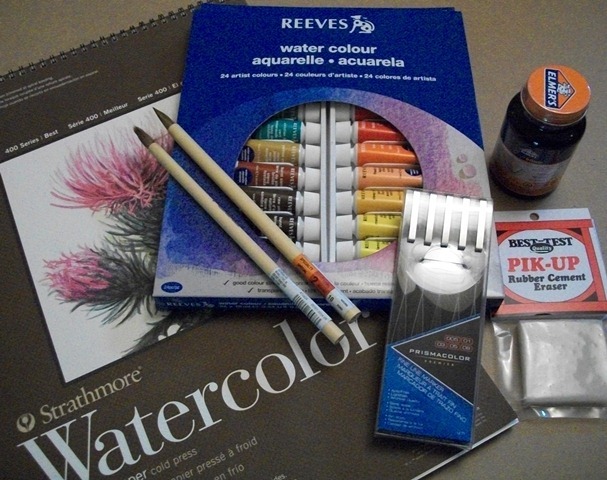 I also invested in a new bottle of rubber cement and a “pick-up” eraser to play with resists. And, I’m very excited to experiment with the Prismacolor markers. They’ll be a step up from the Sharpies.